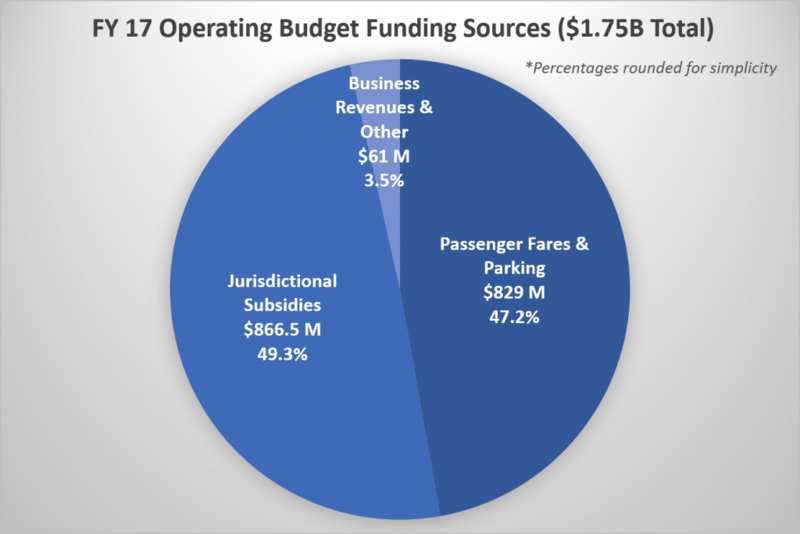 The most important thing to know for this budget cycle is that, despite falling ridership and revenue, the current draft budget includes no fare increase, no service reductions, and no increase to the jurisdictional subsidy. 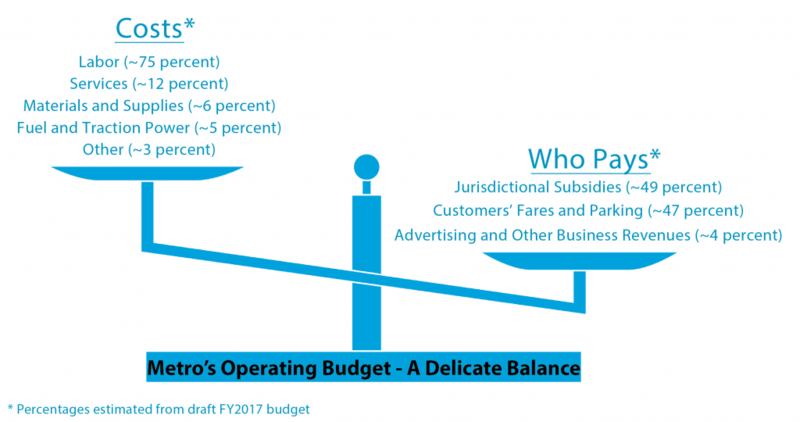 So what’s actually in the proposed operating budget? 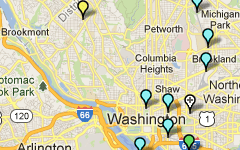 How much will Metro, its customers, and the Compact jurisdictions pay to keep the system running? As you can see in the charts below, the costs of operating the Metrorail system are just over half of the entire operating budget. 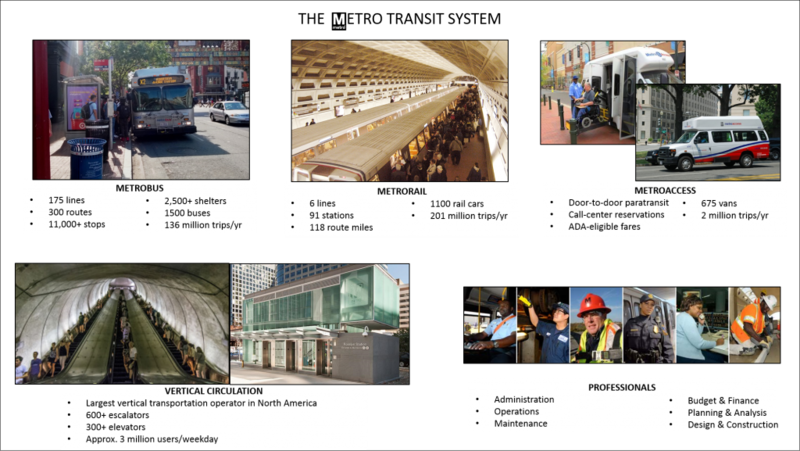 At a systemwide level, personnel is the largest cost category at 75% of the projected budget, which includes all the people who plan, operate, maintain, and repair Metro’s trains, buses, vans, stations, and bus stops. The second largest cost category is associated services, which includes actual delivery of the MetroAccess paratransit service, followed by parts, supplies, fuel, and rail traction power. One new operating expense for FY17 would be hiring 62 additional staff to meet new safety mandates from the Federal Transit Administration (FTA). These new positions would be in three broad job categories: rail training and recertification, rail maintenance, and bus operational testing and safety compliance. The budget also includes additional resources for the Metro Transit Police Department (MTPD) to deploy concentrated safety and fare evasion sweeps on both Metrorail and Metrobus. However, even with those additional staff resources, total expenses of the recommended budget are $79 million less than last year’s approved budget, a decrease of 4.3%. These cost savings are due to $22 million in staff and administrative expense reductions, as well as the shifting of some preventative maintenance costs from the operating to the capital budget, which allows those expenses to be funded by FTA grants. Metro will also explore options for improving the Metrobus customer experience by greatly reducing boarding and travel times. A central strategy for that effort would be moving cash transactions from the farebox to either SmarTrip® kiosks at bus stops or vending machines at retailers, such as CVS and Giant Foods. 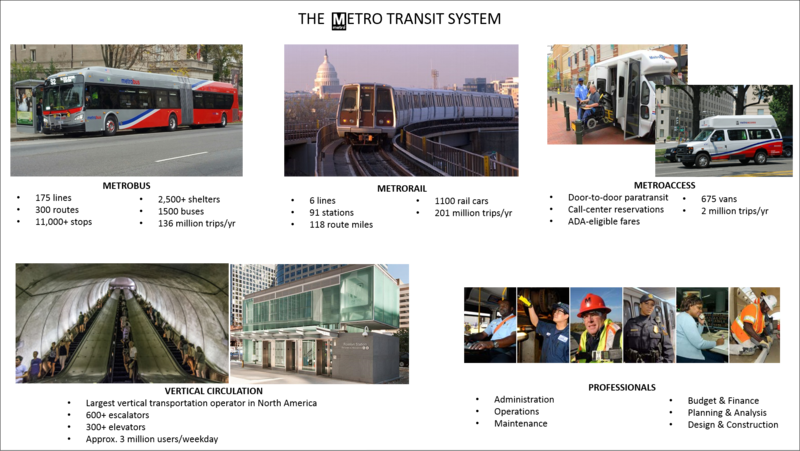 Metro staff is still assessing options for off-board fare payment and analyzing costs and benefits, and will provide regular updates to the Board and the public. It’s important to note how much of the operating cost for each service is actually covered by the fares customers pay. Based on the costs and revenues projected for FY17, “farebox recovery” (the percentage of costs covered by fares) will be 74% for Metrorail, 27% for Metrobus, 8% for MetroAccess, and an overall average of 51% for the entire system. Metro has a standing policy to direct customer fares and parking fees back into the transit services our customers use. But because Metro does not have its own dedicated funding source, any operating costs not covered by fares and fees must be covered by the Compact jurisdictions; that amount is labeled “Jurisdictional Subsidies” in the chart above. These costs are billed to the jurisdictions according to an Allocation Formula established by the Compact (PDF) and Capital Funding Agreement (PDF), and are paid for by a range of local taxes. The Allocation Formula, which is outlined in the graphic below, takes the operating costs for each mode and subtracts the revenues associated with each, resulting in net operating cost (costs minus revenues). The formula then distributes that net operating cost among the Compact jurisdictions according to different subformulas for each mode. Keep in mind, all of this is just what Metro’s staff and General Manager are proposing. It still needs to be reviewed and commented on by you, Metro’s customers and Compact residents, and approved by Metro’s Board of Directors. The Board seeks to approve a final version of the CIP and annual budget in April every year. It must be adopted by June in order to be ready for the start of Fiscal Year 2017 on July 1st, 2016.